I knew I was falling in love with Bread & Butterfly, the new Inman Park restaurant from Cakes & Ale owners Billy and Kristin Allin, after the second bite of my mushroom French dip sandwich during my first visit. The rye bread was crunchy and generously buttered. Gooey strands of Gruyère dangled from the dark brown stewed mushrooms and onions. I dipped the sandwich in the red wine jus and, as I ate, forgot that a French dip is supposed to have beef. The sandwich was unexpected at a place so whimsically French, a place where I anticipated steak frites and a glass of wine, not a crave-inducing vegetarian sandwich. Simple pleasures reign at this jewel box of a restaurant. Bread & Butterfly has generous hours and serves breakfast, lunch, brunch, snacks, and dinner. Chef Bryan Stoffelen, formerly chef de cuisine at Cakes & Ale, is turning preconceived notions of dishes like a French dip upside down and making classic dishes like pancakes so well you forget all others before them. The restaurant, which Stoffelen classifies as European, serves up a wicked cocktail and sells sister bakery Proof Bake Shop pastries. It’s a one-stop shop for all of your dreamy and romantic Parisian-inspired needs. Dark wood bistro tables and chairs lend coziness to the space. A yellow neon sign on the adjoining patio reads “merci” in a playful script. It casts a warm light that cascades across the green- and white-tiled floor. Despite the restaurant’s vintage French feel, you’re more likely to hear the Rolling Stones than Edith Piaf echoing off the dining room’s dark green walls. Like Cakes & Ale, which borrows its name from Shakespeare, Bread & Butterfly also nods to a passage from a literary classic — Lewis Carroll’s Through the Looking-Glass and What Alice Found There. The quote describing a fluttering creature with buttered bread wings and a sugar cube head is printed on a large mirror hanging in the main dining room. My favorite meals to spend here are breakfast and brunch, when stacks of fluffy, decadent pancakes arrive drizzled in butter and maple syrup. Wait, you must be thinking, they put the syrup and butter on before it reaches my table? Yes, but hold on. The kitchen balances the flavors to deliver the perfect amount of sweetness. The edges are lacy, the first bite crisp. Then, closer to the center, they turn creamy and light. This is my favorite dish on the menu. One of the first things any French-trained chef learns is how to make an omelet. Stoffelen must have aced that class. Bread & Butterfly’s omelet has feathery edges that almost resemble rose petals. It comes with a lip-puckering salad of crunchy mixed endive. At brunch a thick piece of toasted brioche loaf sets the stage for loosely scrambled and super buttery eggs topped with smoked trout. While the combination of eggs, toast, and crème fraîche sauce sings, the trout adds a superfluous note of smoke and seafood. Raclette cheese is normally melted, scraped from a large hunk, and eaten with potatoes and veggies. At Bread & Butterfly it’s presented as a gooey riff on potato gratin and served with sour cornichons and the same salad as the omelet. The burger, which comes with crispy bistro fries, is fat, juicy, and just big enough. At almost an inch tall, the patty is topped with melted Swiss, mayonnaise, grain mustard, and caramelized onions, and served on a brioche bun. You’ll likely need an extra napkin. 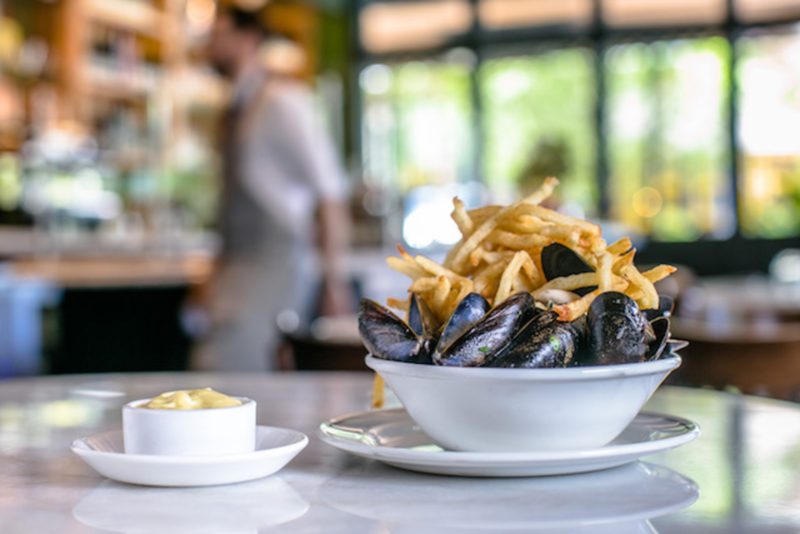 The long, plump mussels of the moules frites special beckoned to me when I saw them delivered to another table. The sauce is a buttery sonnet of wine and clam liquor so good I dipped my fries in it. A roast chicken is covered in a mixture of crème fraîche and herbs prior to cooking. The luxe coating makes the meat incredibly moist and aromatic. Prices are reasonable — no dinner dish exceeds $18 — making Bread & Butterfly a great place to take a date or just stop in for a bite solo. For a restaurant with Proof as its sister bakery, I expected the desserts to taste as good as they look. But a towering layer cake filled with fresh macerated blueberries had a spongy texture and was too moist. The chocolate cake lacked richness. A bit of coffee in the batter or a more intense chocolate might remedy this. The breakfast pastries and small treats are better, including meringues fit for an île flottante and perfect crumbly linzer cookies filled with raspberry jam. The baguette, also from Proof, is so airy and crusty it may dethrone Star Provisions. The bartenders are chatty and friendly as they mix Americanos with Campari, sweet vermouth, and club soda, and slide Vieux Carres across the short marble-topped bar toward guests. As the wine and beverage director at Cakes & Ale since 2012, Jordan Smelt has made a name for himself among Atlanta oenophiles. With Bread & Butterfly now also under his purview, Smelt has focused on French wines for the restaurant’s short but strong list, although it does include six select North American wines in a section entitled ’Merica. Smelt is never far during dinner service to lend some guidance. Service takes its cues from the French and feels professional and proud. Servers wear crisp white button downs and ties or bowties. My water glass always stayed full, even in a room packed with people waiting for brunch. I appreciate thoughtful touches like a sugar cube placed in the curve of the spoon next to my creamy morning cappuccino.